The number of deaths associated with drunk driving has been high for many years. That was the case even before the police had the roadside testing equipment. In our minds, that means drivers are still struggling to get the message. So, we’ve decided to publish some key statistics in this post. With a bit of luck, they will help you to understand the situation. They should also encourage you to be more careful on the roads. That’s right guys. Young people are the worst for drink driving. Maybe it’s because they have not yet witnessed the consequences of such actions. You should never consume alcohol when at the helm of a motor vehicle. The police don’t test people on the side of the road unless they have suspicions. However, with over 20% of results giving a positive reading, there is obviously an issue. On top of that, you are around twenty times more likely to become involved in an accident if you are drunk. Most people don’t realise that alcohol stays in their system for a long time. Indeed, that is why they often get caught between 6 and 8 am. Arrests at that time have increased by 4% since 2011. Anyone who wants to find out more information about the realities of drink driving should take a look at the infographic below. 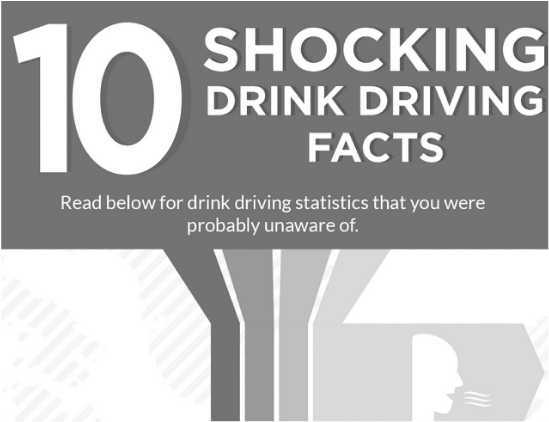 It tells you some shocking facts that might help encourage you to think twice in the future.